NOTE.... FANCY THAT PHOTOGRAPHY ACCEPTS A VERY LIMINTED NUMBER OF SENIORS PER YEAR! Once those sessions are booked we have to stop so that we can deliver the best experience possible to each and every one of our clients. Due to the limited number of seniors we can accept, we require SESSION PAYMENT IN FULL WHEN YOU CALL TO SCHEDULE. Don’t miss out… call 719.371.1945 to reserve your session today! Either in person or over the phone! We offer a complimentary design-consultation in our studio to answer all of your questions and to allow you to meet Gwen and view our work in person. The consultation is a key part of your custom experience at Fancy That Photography. This is where we will get to know you and begin to plan out every detail of your experience. The consult is relaxing and fun, and will help you start to envision your story as we bring it to life. We require both the senior and at least one parent at the in-person consultation at the studio. Call us to schedule a consultation appointment 719.371.1945. NOTE: Booking must be completed by a parent (or legal guardian) unless the client is of legal age and will be the one fully responsible for all financial decisions. Do plan on booking your session sooner rather than later ~ in most cases, giving 3-4 weeks in advance is sufficient though for the fall months we book 6-8 weeks in advance. A $500 reservation fee is due at the time you book your session to reserve your date. The super nice thing about this is that a portion of the reservation fee pays for your session and the remainder is applied towards your order at your Order Session. Upon payment, your appointment is official! If you need to reschedule, your reservation fee will apply to your newly scheduled day and time. However if you cancel or no show, your reservation fee will not be refunded. This fee covers the personalized consultation, the planning and preparation for the session, and the time and talent of the photographer during the session. The reservation fee does not include any images or products, and is a non-refundable fee that is required in order to secure your Consultation, Session date and Order Appointment on our calendar. WHAT IS A ‘DESIGN CONSULTATION’? Prior to your photo session with us, we’ll meet with you to discuss the details of your upcoming portrait experience so we’re set up for a successful and fantastic time on the day of your session! During the design consultation, we go over makeup, location options, weather, time, ideas, outfits, style, and any other questions you have regarding the session. We will discuss ways to display your portraits and any questions you have about cost. Having a plan for what to do with your images once we have them is key to your ultimate satisfaction with your senior portrait experience. WILL I BE PHOTOGRAPHED BY GWEN...OR ANOTHER PHOTOGRAPHER? 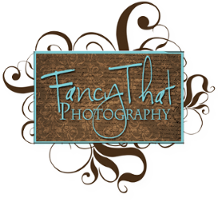 Gwen Bradbury is the owner of Fancy That Photography and does all of the photography work you see on our website. We do not out-source your photo session. Gwen has years of experience in what angles will make you look your best, what lighting will make you look fantastic and what poses will really compliment you during your session. She doesn't just snap away hoping for some lucky shots… she creates the images she wants before even raising the camera to her eye… which makes a difference for YOU. Add that to her ability to be spontaneous enough to take advantage of opportunity, and her artistic eye that will make your portraits unique and special to you. HOW MUCH SHOULD I PLAN TO SPEND, AND WHAT DOES 'MINIMUM INVESTMENT' MEAN? Oh my gosh, please look at the "Boutique" link on our website to get an idea of what your investment means. It means treasured heirlooms and gorgeous daily reminders of what you value most ~ your family; all put together in jaw-dropping phenomenal ways. With the loss of both my husband and dad in the last several months, the immense value of imagery has been deeply ingrained in my heart and is truly, truly priceless. Over the years, we've found that our clients like knowing what to expect. Having a minimum investment requirement in place has helped our clients establish and prepare a budget for the complete experience well ahead of time. This also allows us to allocate the time and quality of service required in order to consistently deliver the highest level of personalized experience to every one of our clients. When budgeting for your Fancy That Photography experience, you should account for both the session fee and the minimum investment which is the minimum requirement that you must invest in your final images at the Order Session. Some seniors spend just over $1400, others spend $4300 or more, while most fall somewhere in between and there are many portrait options to fit your budget. The final amount that you ultimately invest is entirely dependent on you, as everyone’s individual preferences for displaying their final images may vary and our services are completely customized to you and your needs. Some parents make payments prior to the Order Session in order to help divide up the final cost. We accept all major credit cards and also have convenient 2, 4, and 6-month payment plans for all our Portrait Collections. You'll adore being able to take your artwork home ready to hang and you'll love being able to order unique sizes so that important parts of images aren't lost due to cropping restrictions. When you see for yourself how simple choosing the art for your walls really is with our state-of the-art software and that your other favorites can go into your gorgeous album ~ you'll happily realize the pressure is off and you really can afford to keep them all. You'll delight again when you realize the work is done for you and that you've invested in heirlooms to be passed on! You'll be thrilled again in the spring when it is time to order graduation announcements and you realize we design these for you too! No shipping to pay, the details are taken care of and your friends will ooh and ah over the quality. From start to finish, your experience with Fancy That will be top notch and we'll take care of your senior like they were our own child, guaranteed. You'll select your favorites for your Portrait Collection at your Order Session after your session is complete and Gwen has had time to professionally edit your images. By booking your senior portrait session at Fancy That Photography, you are making a commitment to the minimum investment required for your session. In order to provide you with the level of experience we strive for, we must turn down other clients in order to dedicate our time solely to you throughout the entire process. The minimum investment must be paid in full at the Order Session as compensation for services rendered, whether or not product selections have been made. Prints and custom-designed boutique items are sold separately, either a la carte or in pre-designed Collections. Gift sized portraits are available, starting at $55 for 5x7s or 8x10s. We have Portrait Collections starting at just $1489. Our Portrait Collections can save you as much as 40% and include framed wall portraits, stunning canvas clusters, gorgeous albums, metal artwork, Gift Sizes, Wallets and Web Share images. Most parents need portraits for their walls and gift prints to share with family and friends and most seniors want plenty of wallets to share with friends and web images for sharing on social media. We can find the happy medium that meets both of your needs! All sales are final. We offer 2, 4, and 6-month payment options and you can take advantage of our convenient payment contract at this time. Fancy That is a full service boutique studio offering unique and cutting edge products custom designed with your photos and style. We offer exclusive designs for canvas wall gallery displays, gorgeous senior announcements, incredible Luxe storybook keepsake albums, and dynamic metal art pieces. We also offer custom collages, DVD videos of your images set to music so you're ready for your grad party, custom phone apps and lots of other fun things that make your senior images memorable! At Fancy That Photography we work with the finest professional labs and the possibilities are endless! There's definitely something to catch your fancy! Almost all of our seniors and parents agree that one of the things they treasure the most is the highly sought-after custom handcrafted storybook keepsake albums! Every image in your order is retouched for you at no charge! This includes blemishes, under-eye circles, whites of eyes, stray hairs, color balancing and tonal adjustments. Additional retouching for severe acne, scars, red eyes, unwanted shine, braces removal, etc, can be done upon your request. Simply ask for an artwork quote. Likewise, all artwork is printed with leading professional labs used by many famous portrait artists across the country. The absolute best quality is seen in every product at Fancy That. All portrait prints include a lustre coating to preserve and protect your photographs over the years. A fine linen texture is included at no additional charge to you and wall portraits with this texture do not have to be put behind glass. An added benefit to you is that all Gift Prints and wall Portraits are professionally mounted for preservation. We purposefully mount all Gift Print and Wall Portraits on styrene, sintra or Masonite and avoid art board (popular with other photographers) as it is not a good choice in our dry Colorado climate. Again, these quality points set our studio apart from others and add archival value to you. EVERYONE IS SO PHOTOGENIC ON YOUR SITE. I'M NOT SO SURE I AM. You would actually be surprised how often we hear that. Many of the people we photograph doubt that they will photograph well. Gwen believes that there is something special about every person she photographs...she looks for it and captures it. One of Gwen's clients described her as a "heARTist" because she puts so much heart into her work and is so skilled in bringing out the beauty and personality of each person she works with. So no worries! You aren't alone if you don't think you're photogenic. Leave it to us. We love what we do...making you look amazing and fabulous in a photograph! If you love the images you see on this site, you will love the images we create about you, for you. WHERE DO YOU PHOTOGRAPH SENIORS? Questions about locations are common. You get to decide! You'll select from our exclusive outdoor studio options and from unique (and some hidden) amazing locations in and around Fremont County! Some of these locations may be similar to the locations of your friends. I often hear, 'I want different.' You are responsible for the amount of different you bring to your session whether it be through styling, props or personality. Your location has very little to do with how different the images we create will be unless it is based on a personality trait. If you like to kayak, ride horses, off-road, play sports, sing, dance, play an instrument, have a hobby then all of these things will assure your session is different from your peers. Upon booking your date with us we'll talk about the options and discuss what your vision is as every part of the experience is customized for you. We'll help you with this if you aren't sure. Your personality, tastes, spirit of adventure and time frame all have an impact. Your session could take as little as an hour or go up to three or more hours. Don’t plan on anything else the night of your session. If we’re going to take advantage of opportunity, the last thing you want is to have to worry about getting to another appointment or team dinner, etc. Your images will be unique, fresh and completely you. That's another thing our seniors love about working us! Their images fit their personality SO well! WHAT'S THE BEST TIME OF YEAR TO BOOK MY SENIOR SESSION? YOU HAVE LOTS OF GIRLS ON YOUR SITE---DO YOU PHOTOGRAPH GUYS? Of course! Though the guys tend to want a shorter session unless they have lot of sports and hobbies (which of course requires more time). We have a lot fun with senior guys and even though some are doing senior portraits just for their mom, they end up having a good time. One of the most common things we hear from the guys is "wow that was great---I actually had fun!" It's important to wear what you love that represents your unique style. Upon booking your session, we will provide you with our exclusive WHAT2WEAR Guide with tips and suggestions on how to pull together the looks you'll love in your photos. Our style focuses on YOU so the clothing is secondary. Unlimited clothing changes become more about changing clothes than focusing on how to photograph your face in the best possible light and pose. Plus, with more changes you spend less time in front of the camera and more time in the changing room. That's why our sessions have specific amounts of time and clothing changes. Gwen wants to focus on making you look awesome in your photographs! We plan for about thirty minutes per location and you can plan to change clothing during each change of location. Gwen will help you with your wardrobe choices and make sure that each outfit "matches" the locations you chose. Another cool and unique thing is that we have a portable changing tent for you too! No changing in your car! That's just one example of the extra steps we take to ensure your experience is awesome! Do you want to include your pet, your car, your friend, or go a bit out of town? Then plan for a longer time frame. Bottom line ~ we go above and beyond the average studio, and know how to bring out your true personality. We have fun making you look fabulous! Making YOU look good truly does make us look good. We photograph most of our sessions outdoors, although we do have studio space that we use in combination with outdoor photos if you choose. Weather might impact our portrait session with you! We never compromise your photo day and never take a chance, so if rain or heavy winds are in the forecast we simply reschedule with you. Typically, if the weather forecast calls for a 50% chance of rain or high winds our policy is to reschedule. I will be in touch with you the day before your session or the morning of your session if the forecast predicts rain or high winds and we reschedule you at the next available date. Refunds will not be granted due to weather changes. Your session fee will apply to your rescheduled date. Life happens, we know, so if you need to reschedule, please EMAIL US A MINIMUM OF 24-48 hours in advance. Our session fees are non-refundable, but you may use it for a one-time reschedule (if EMAILED within the 24-48 hour window) to be scheduled within six months of your original appointment date. Additional reschedules require a fee of $125 per occurrence and are subject to schedule availability. When your session day arrives, relax, be yourself, and have a good time. Since we have already planned the entire session, you won’t feel awkward, unprepared, or nervous during the session. The time we spent planning at your consult allows us to have a plan so everything can go smoothly ~ which means less stress and more fun for you! Many seniors don't want it to end and would do it again in a heartbeat! They tell us they've never felt more beautiful or comment about how much fun they had! Many of the moms tell us how much their child's confidence grew when they finally saw themselves as other's see them. Oh how we love bringing out that beauty and charisma! We take the time to ensure you look your best with the light, composition, clothing harmony, and posing. One the day of your session, you will arrive at our studio at 623 Spruce Court, Cañon City, CO unless we have made prior arrangements to meet elsewhere. Please arrive on time and bring all your outfits inside. We'll finalize our plan by selecting which ones to use in each location based on the style, colors and textures. These details are an important part of our process and impacts the end result for you! What else impacts your results? Gwen's knowledge of her state-of-the-art equipment makes a difference for you as does her experience and posing expertise. The time she take to light you properly makes a difference for you. The shimmer in your hair. The gleam of light in your eyes. The soft curve of your cheek. The sleek lines of your muscles...All so poignantly defined and rich with sharp clarity and vivid color is a direct result of Gwen's lighting and skills behind the camera. This is a key area in which you don't want to be tricked by another studio who charms you with "natural light" which likely just means they haven't mastered off-camera lighting. Another huge advantage for you is that Fancy That is able to optimize your session time because we always have a lighting assistant with us. You'll love Lisa and her personality, plus she helps us haul equipment and furniture so you can use it in your session! She carries bug spray and water for your use to name just a few. Talk about taking your senior experience to another level! Her sense of humor and teasing will have you chuckling at the most inopportune moments! Sometimes that’s when the magic happens and when your Mom sees the images she tears up at that truly genuine smile that makes her hug you just a little bit closer. ...You know...all that stuff that you roll your eyes about because of her talk about how “her baby is growing up,” but that really secretly touches your heart. Those become the magical images in your book that allow your personality to shine and the gorgeous artwork on your parents walls. Unforgettable. Authentic. Real. WHAT ABOUT MAKEUP? DO YOU PROVIDE IT? Absolutely! We have partnered with an incredible makeup artist that will create amazing looks for your photo shoot. DevAnn DiOrio of C&D Artistry provides special pricing just for Fancy That Seniors and knows how to apply makeup specific to photography so this is a fabulous option for that natural camera-ready look. She does makeup especially suited to OUR photography style with off-camera lighting and specifically with a natural, fresh look in mind. A look that even your dad will love. BUT...some girls prefer to do their own makeup and that's ok too! We have a makeup tip guide for you in your Welcome Packet if that is your preference. Otherwise, you will absolutely love the results with DevAnn! Regarding hair, we want you to come with your hair styled the way you love it. Someone else doing your hair for the first time, never having styled it before, can create unexpected results and we want you to love your hair on photo day. If you just wish some simple lasting curls, then DevAnn can take care of that for you when she does your makeup. WHAT ABOUT THE EDITING PROCESS? If you are photographed between the months of March to May your session will typically be finalized and ready to order within three weeks. Between the months of June - August expect a time frame of four- five weeks. If you are photographed between September - November expect a wait of up to six-eight weeks as this is our busiest season of the year. An exciting part of the Fancy That experience… 5-8 weeks after your session, your originals will be ready for you to view and you’ll be invited back to the studio for your Order Session. This is time set aside to finalize your portrait order, so be sure and schedule a time when all decision makers can be there as this is when your final decisions about what to order are made. We understand that purchasing and arranging art isn’t something you do everyday and it may even feel a little daunting. The good news is that arranging portraits IS something we do every day and we would love to answer any of your questions and share with you what we’ve learned over the years. We would also love to show you all of the other various options that enhance your order like albums, books, cards, prints, etc. You will be blown away when you see what we can create together. Like everything we do at Fancy That Photography, your Order Session is highly interactive and personalized. Most photographers slap some photos up on a website and leave you with the daunting and sometimes very confusing task of choosing images. Using our state-of-the-art software and photos of the walls in your home, Gwen will show your senior portraits scaled onto your walls, which solves the problem of what size to order; not too big, not to small, but just right! You’ll love that our studio software allows for side-by-side comparisons, cropping adjustments, and actual viewing of your images on your OWN walls and you'll love getting to view, touch and feel the quality of our products to decide exactly how you want to display your favorite images. Our clients are thrilled with the Ordering Appointment process and love the confidence it gives them in their decisions. It is phenomenal to see what your artwork is actually going to look like on your walls and our specialty is helping you select the best images, photo groupings, books, and frames suitable for your home, office and gifts. It is reassuring to find that your Order Session allows you to choose your absolute favorite, goose-bump causing, make your heart quiver images for your walls and your other top favorites for your Portrait Collection when you realize that your other favorites can go into your gorgeous keepsake storybook album as that takes the pressure off. You'll be in awe that you have this opportunity to create family heirlooms of this quality and substance and rejoice in what that means to your family. (not to mention making your friends drool). Plan on the Order Session taking approximately the same amount of time as your session took, as well as arranging for a babysitter for children under the age of 12. All orders must be paid in full at the time the order is placed and all sales are final. You may also take advantage of our convenient payment plan agreement at this time by making a 50% payment and use a 2, 4, or 6 month payment option. Order Session appointments are available on Wednesday and Friday during business hours with our latest appointment being 4:30. At the time the order is placed, please be ready to pay 100% of your total order. Orders are custom-made and all sales are final and non-refundable. Balances must be paid in full to receive any digital or yearbook images and orders must be paid in full before leaving the studio. We take deposits in advance to help you budget, so feel free to space out payments. Likewise, we know there are a lot of expenses your senior year and offer several convenient payment plan options for you and your family. Ask about our options and let us help you design a plan that works best for you. We accept cash, check, Visa, MasterCard, Discover, AMEX. I CAN’T WAIT! WHEN DO I GET TO BRING EVERYTHING HOME? Quality takes time, so please allow 5-8 weeks from your order date for completion of your order (Custom designs and handcrafted storybook albums will take longer) and you'll be able to enjoy those memories for years. Your portraits aren’t just any old photos you can get printed anywhere and we would never take the chance of damaging our reputation by doing so. We send your images to our lab that specializes in professionally printing portraits. We have calibrated our equipment and color profiles specifically to theirs and we personally inspect every print that comes into our studio. Your products will be archival (meaning they will last) and are guaranteed to be individually hand printed and quality checked. Our labs are masters in printing on a variety of materials, which is crucial as you have a variety of print and display options for your portraits. These prints reflect the beautiful parts of your life and our goal is for you to leave our studio with a high-quality, finished product. Please allow us the time needed to provide you with the quality you expect! It’s worth the wait! We promise that you’ll be just as excited about your portraits the day you pick them up as you will be many years later, after countless compliments from your friends and family. Now you can relax. The hard work is over. Your portraits adorn the walls of your home. Your senior's phenomenal book will be passed on for generations. Your graduation announcements will be oohed and ahh-ed over repeatedly. Sit back and take credit for creating that beautiful human that is your child and get goosebumps every time you walk past their artwork on your walls. In order to give you the highest possible experience, we archive all ordered images for a period of 2 years. Images not ordered are removed from our system following the ordering appointment. We do not keep or archive any files which are not ordered at your View & Order appointment. WHAT IF I WANT TO USE AN IMAGE FROM MY SESSION FOR THE YEARBOOK? Any purchased image may be used in your school yearbook. We will provide your yearbook choice to your school or yearbook advisor upon payment in full for your order. You can choose this image at your ordering session. Under U.S. Federal Copyright Law, Fancy That Photography retains all copyright ownership of all images created, and images may not be reproduced, duplicated or printed for any reason without our express written permission. Unauthorized copies are subject to a $500 per image per incident penalty or $15,000, whichever is greater. This includes digital scanning, screen capture, printing, or posting on websites such as Facebook/Instagram and any other reproduction. Our clients love the fact that every Portrait Collection comes with some webPix images that are enhanced and web-optimized for use on mobile devices, tablets, and social media outlets (Facebook, Instagram, Twitter, etc) perfect for archiving and sharing with family and friends. All webPix carry the Fancy That studio logo and may not be cropped or altered in any way. Most of our Portrait Collections also include a digiAlbum for your smartphone so you can have and share your images directly from your very own phone app! WebPix and DigiAlbum images are not suitable for printing. Please do not apply filters to the finished art to post to social media as it diminishes the quality of Gwen's work. From start to finish...Your personalized consult, your individualized session, your custom hand-editing and retouching, your personalized order session, your quality-checked beautiful artwork....That’s the sort of custom boutique experience we offer. Combining our unique elements at the studio, some gorgeous Colorado locations, our fun and easy-going personalities and positive energy, our fresh style with bold rich color, totally cool unique and custom products, and your vision, we will provide your family with artwork that matters. Artwork and memories you’ll treasure forever.